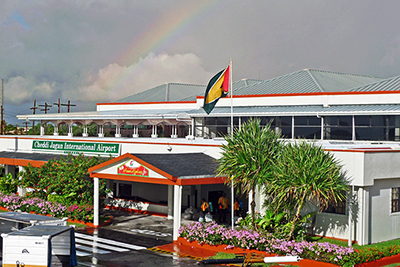 Guyana is an emerging economy with enormous untapped potential. The country’s geographic position at the gateway to the Caribbean and South America, combined with its natural resources, access to key export markets, English-speaking population and affordable labor, present investors with unlimited business opportunities. Supported by stable macroeconomic policies, attractive investment incentives, a regulatory environment and non-discriminatory corporate tax regime, Guyana also provides investors with favorable conditions to do business over a broad spectrum of activities, particularly in export-oriented industries. Opportunities include mature, yet often lucrative sectors, such as mining, timber, sugar, rice and seafood, as well as emerging sectors such as non-traditional agriculture (e.g. fruits and vegetables), agro processing, aquaculture, value-added wood products, light manufacturing, tourism and IT-enabled services (e.g. call centers, medical transcription). In particular, the enormous growth potential of Guyana’s non-traditional sectors remains essentially untapped. 1) Highly fertile soils in the coastal areas - currently used extensively for rice and sugarcane production, with large parcels of flat irrigated land that can be used for fresh fruits and vegetables, dairy and beef production (Guyana has been certified as free of foot-and-mouth disease). 2) The Intermediate Savannahs - have untapped opportunities to produce beef, milk, mutton, citrus, corn, cashew nuts, legumes, peanuts, soybeans, dairy products, and orchard crops. The savannahs have large tracts of brown soils that are well drained and responsive to fertilization, creating an ideal environment for the application of high technology and the establishment of medium/large scale agriculture operations. 3) Organic cropland – Guyana has large expanses of land that have never been used for modern agriculture and remain totally free of agricultural chemicals. These lands could be certified for organic production within one year, as opposed to the traditional three-year certification process. 4) Irrigation – Nearly 30 percent of Guyana’s cropland is currently irrigated. 5) Agricultural Population – Whereas the populations of most Caribbean countries have become urbanized, over 50 percent of Guyana’s population remains rural and closely linked to agriculture. 6) Trainable Farmers – Guyana’s farmers are eager to learn new methods and practices, such that technology transfer occurs quickly when the appropriate systems are put in place, resulting in an immediate impact on productivity and quality. 7) Markets – Guyana is in close proximity to the 15 member countries of CARICOM and is positioning itself to be the gateway to South America. Fresh Vegetables and Fruits – Export opportunities exist for a range of vegetables and fruits such as cucumbers, pumpkins, watermelons, pineapples, melons, saeme, bora and callaloo within the Caribbean and North American markets. In addition to fresh produce, opportunities also exist to supply Guyanese or Caribbean food processors with raw inputs. Plantains, Roots and Tubers – There is potential to increase Guyana’s exports of selected plantain, roots and tubers to ethnic markets in the Caribbean, North America and Europe. Opportunities also exist for malanga, breadfruit and ground provisions as raw inputs in the snack food industry. Organic Products – Guyana has large tracts of land free of agricultural chemicals providing a unique opportunity to meet a growing demand for organic products in North America and Europe. In most cases, organic products receive a premium price compared to their conventional counterparts. Organic pineapple and organic heart of palm are already being exported. Herbs and Spices – There is growing demand in the Caribbean, North America and Europe for hot peppers, eschallots, celery and other ingredients for seasoning, all of which grow abundantly in various parts of Guyana. Livestock and Dairy Products – There are excellent investment opportunities for the production of meat (beef and mutton), poultry products, milk and milk products for both domestic consumption and export to the Caribbean. In particular, Guyana’s savannahs provide a favorable environment for medium to large-scale cattle-rearing. Guyana has been certified as free of foot-and-mouth disease, providing it with favorable access to many markets. Processed Foods – Opportunities exist for processing, or semi-processing, produce and animal products. Already, Guyana’s exotic and gourmet food products are in demand in the Caribbean, North American and European markets. Products with a large growth potential include jams, jellies, sauces, processed spices and fruit puree blends. Aquaculture - Guyana has the ideal conditions for a dynamic seafood and fisheries industry. These include a 459 km Atlantic coastal zone and an extensive network of rivers. The U.S. is the primary market for most seafood exports. In 2004, however, Guyana was certified to export seafood to the lucrative EU market, creating a range of new market opportunities. Seafood - While the seafood industry primarily consists of marine species caught in Guyana’s exclusive economic zone (EEZ), aquaculture has recently attracted significant investment growth. Guyana enjoys vast fisheries resources in the Atlantic Ocean, both in its coastal areas and its EEZ, which includes 138,240 square kilometers - equivalent to 64 percent of the country’s landmass. Guyana provides a number of opportunities for investors within the energy sector, particularly with regards to petroleum, gas and hydropower generation. It is estimated that large deposits of oil and gas lie offshore. With the settlement of the dispute between Guyana and Suriname over maritime boundaries, petroleum exploration in the prospective Guyana-Suriname Basin within Guyana’s maritime zone has recommenced. Petroleum Prospecting Licenses have also been awarded to companies exploring for oil in the Takatu Basin in the Rupununi district near the Brazilian border. With its extensive river network and favorable topography, Guyana has promising potential for hydroelectric generation for both domestic consumption and electricity exports. Work has commenced on the Amaila Falls Hydroelectric Project which is expected to provide approximately 140 MW of power to the national grid. The location of the power plant is the Kuribrong River, which is a tributary of the Potaro River. The Government is also keen to develop alternative energy sources such as wind and solar power. Proposals for the establishment of alternative energy projects – wind farms, solar power – are being encouraged by the Guyana Energy Agency. Guyana has vast forest resources that cover more than three-quarters of its landmass and contain over 1,000 different tree varieties. Currently, 120 species are being logged in various forms, with between 12 and 15 of these logged on a commercial scale through a system of concessions. While Guyana is traditionally known for its export of timber in raw or semi-processed forms, the Government and segments of the forest product industry have placed an emphasis on promoting value-added forest product production for export to the Caribbean, U.S. and Europe. A number of lucrative opportunities exist for investors interested in working with Guyana’s wood industry. These include furniture (e.g. hardwood and wicker), plywood and veneers, molding and doors, parquet, floor tiles, and other related products. Within these product sectors, additional value can be achieved on investments that meet the requirements of certain environmental and social certifications from organizations such as the Forest Stewardship Council (FSC). There are also a number of opportunities to expand the development and marketing of lesser-known species where utilization is well below capacity, or where species are yet to be utilized commercially. Even in cases where the availability and accessibility of species does not warrant large-scale exploitation, lucrative opportunities exist for investors able to develop products for niche, high-value markets. English-speaking Workforce – as an English speaking country, there are few language barriers for providing voice or data services to customers in the U.S. and Canadian markets. This has helped draw the attention of BPO companies based in Latin America. Accent – recent investors note that Guyanese workers have an accent more compatible with the U.S. market than those in other Caribbean islands. 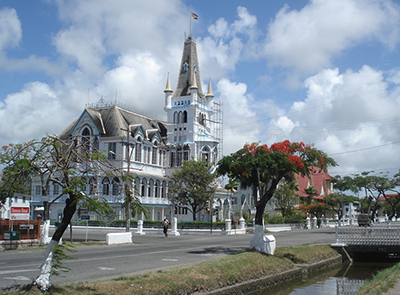 Skilled and trainable people – Guyana’s workforce is literate and trainable. To date, call centre investors have noted their ability to attract higher skilled workers, making it possible to reach higher productivity levels. Time zone – Guyana is in the same time zone as the east coast of the U.S. and Canada, allowing firms to work with customers in those countries on a real-time basis. 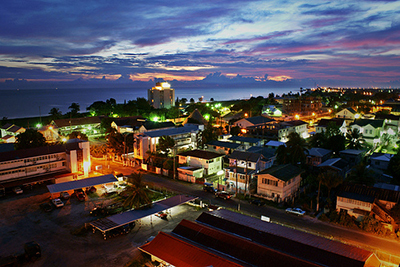 Communications Cost – Guyana is able to provide call centers with reasonable ICT costs. The Government is eager to attract further investment in this area. Not only is the Government providing attractive incentives for investors (e.g. tax holidays), it is also taking steps to improve the regulatory framework for sectors utilizing ICT for services targeting domestic and international markets through the development of policy strategies for ICT and E-commerce. • Garments and apparel manufacturing. • Value-added/manufactured forest products – furniture, flooring, doors, plywood, veneer, etc. • Agro industries – processing, canning and bottling of agricultural produce; fertilizers and insecticides. • Packaging – manufacture of packaging materials and containers for transport of finished products. • Leather craft – manufacture of leather products and souvenirs. • Ceramics – manufacture of articles constructed of clay, kaolin and silica sand. • Construction Materials – stone, cement, clay blocks, tiles, and glass. There is a particular interest in expanding Guyana’s garments and apparel sector to build upon recent successes and to take advantage of preferential access to foreign apparel markets under preferential trade agreements with the U.S., E.U., Canada, CARICOM and other bilateral trading partners. Situated on the mineral rich Guyana Shield, Guyana has attracted international interest from the largest mining companies in the world. While the mining sector is primarily focused on gold, bauxite and diamonds, Guyana also contains deposits of semi-precious stones, laterite, manganese, kaolin, sand resources, radioactive minerals, copper, molybdenum, tungsten, iron, and nickel among others. Guyana produces high-value refractory-A-grade bauxite, which is produced nowhere else except in China. The mining and quarrying sector represents a critical component of Guyana’s economy, accounting for 50 percent of exports. The substantial increase in the price of gold over the last few years has given rise to increased declarations and exports. Interest in gold mining has also increased. The prospects are encouraging and exploration results suggest that significant gold deposits are still there to be mined. Government’s support for the sector is evident with improved hinterland infrastructure and a favourable fiscal regime. The Government is interested in securing large-scale investors for the mining industry, especially in the areas of gold and bauxite, for exploration purposes and to improve the efficiency and productivity of operations. The licensing regime established for this sector embraces a royalties and fiscal system, which provides investors with attractive terms for exploration and production projects. Mining is a trenchant sector of the Guyanese economy, with well-established rules of the game and a safe operating environment that offers investors flexibility in establishing the infrastructure and operations necessary for them to be successful.